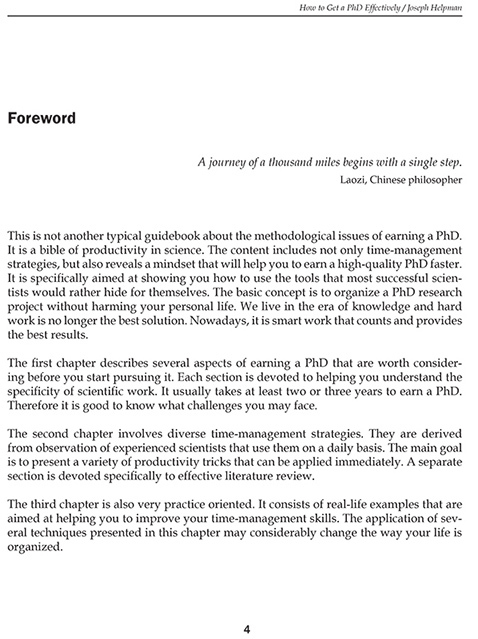 This is not another typical guidebook about the methodological issues of earning a PhD. It is a bible of productivity in science. 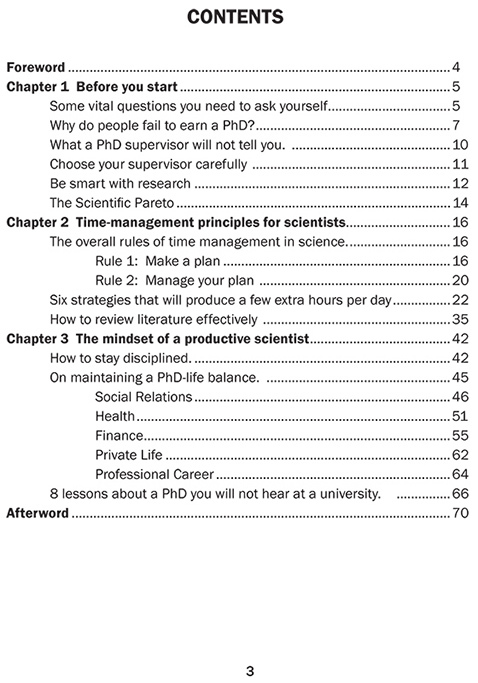 The contents include not only time-management strategies, but also a mindset that will help you earn a high-quality PhD faster. It is specifically aimed at showing you how to use the tools that most successful scientists would rather hide for themselves. 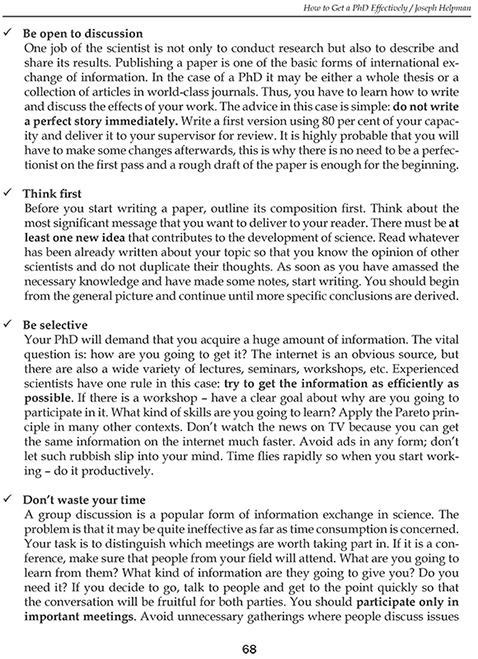 The goal is to organize a PhD research project without harm to your personal life. We live in the era of knowledge and hard work is no longer the best solution. Nowadays, it is smart work that counts and provides the best results. This is why, from now on – don’t be just a dreamer, be an achiever. Get a PhD fast and smart. Let me show you how to do it!! This will help you to stay disciplined and speed-up your work with no additional effort. These are very powerful organization tools that take you to the top level of productivity. 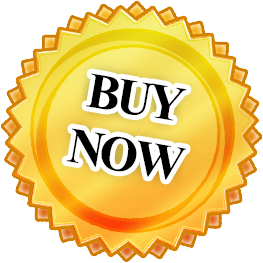 This is aimed at finding the 20 percent of activities that will give you 80 percent of your results. This is a step-by-step guide devoted exclusively to simplifying and accelerating the process of literature review. A profound comprehension of this issue will help you find a source of motivation and keep up with the commitment. 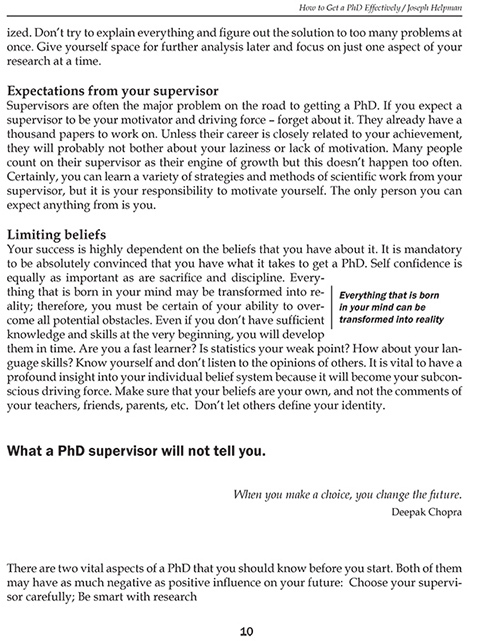 The methods that allow you to maintain a balance between your PhD, work, private life, health and finances. Have a look inside the book and make sure it’s worth reading! My name is Joseph Helpman and I am a scientist. 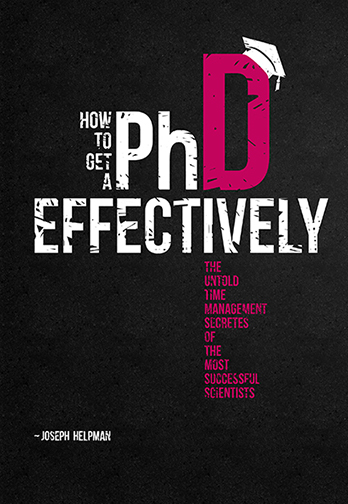 I wrote this book because the majority of people who want to get a PhD don’t have adequate time-management skills to complete it. It’s a pity to see them struggling with problems that can be solved ten times faster and with much less effort. 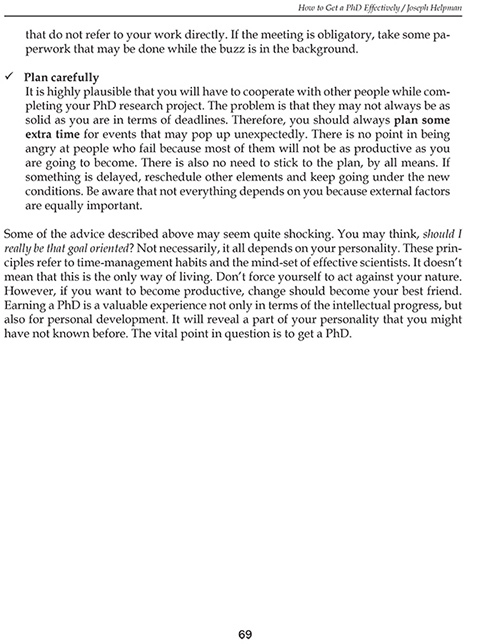 People also tend to forget about maintaining a PhD-life balance, without which they can experiencenegative effects to their private life, health, finances, etc. 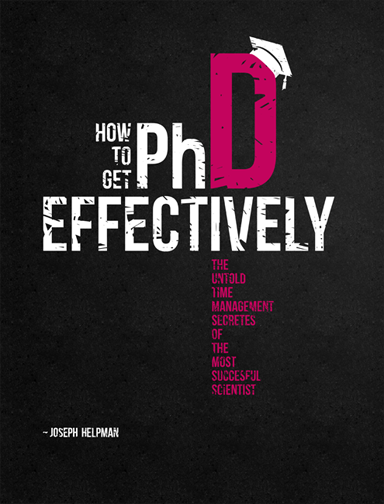 Earning a PhD is not that difficult if you know how to manage the process. I also wrote this book because I don’t accept the old paradigm of work: In order to succeed one must work hard. People tend to worship this belief, and the harder the work, the greater result is expected. It is the 21st century and I believe that you don’t have to work hard, because it is the smart, well-managed effort that pays off in the long run. 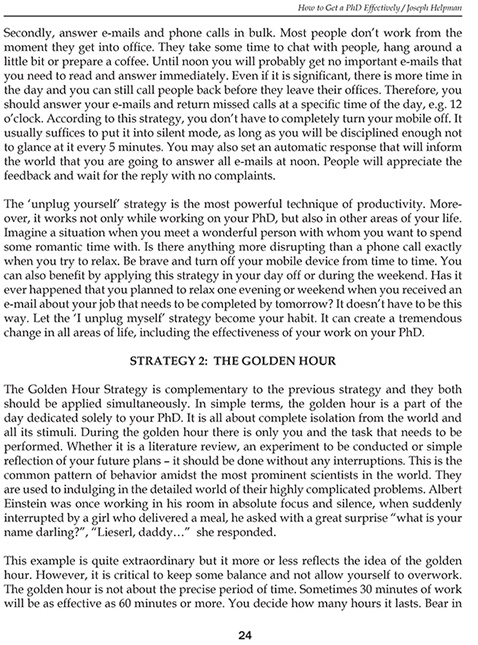 This is the first book about time management for people who want to earn a PhD. 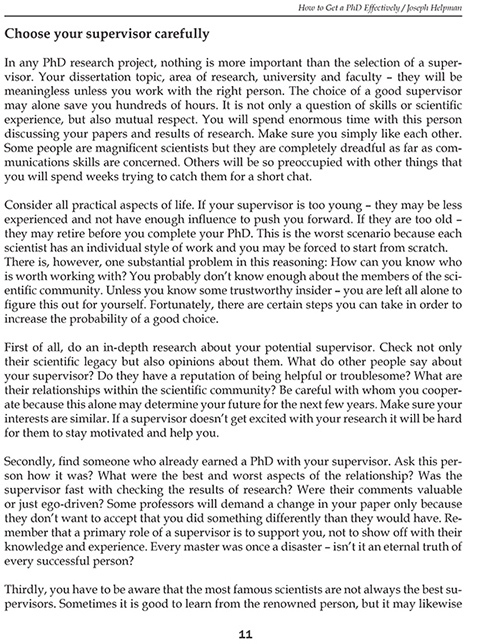 It is based on my experience and the lessons I learned from other scientists. Some of them are very famous and not accessible to a broader audience. 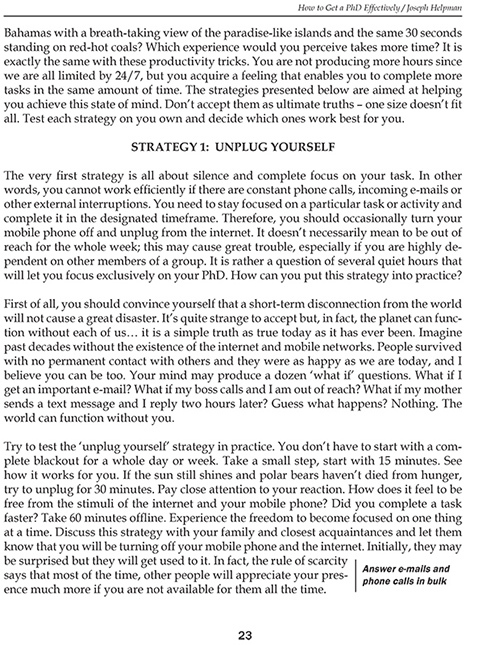 I spoke to them and found that they apply certain strategies repeatedly. In fact, those who get a PhD faster, have similar productivity habits, all of which are thoroughly analyzed in this book. I earned my PhD in 4 years. It could have been completed much faster if I had known about the suggestions in this book. Joseph Helpman is not my real name. I use a pseudonym because some ideas that I share with you are controversial and could possibly take a toll on my position in the scientific community. However, I promise to disclose who I am after selling 200,000 books worldwide.